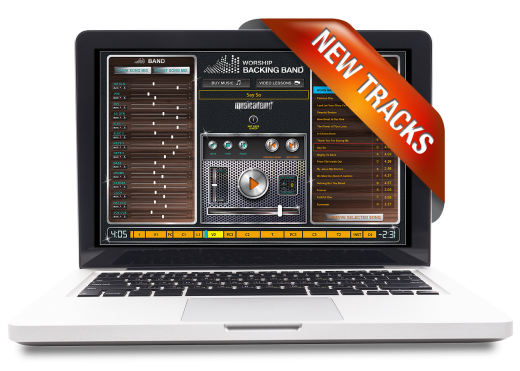 We’ve just launched another batch of five new MultiTracks. As ever these are big, well known songs with familiar arrangements but in the usual Worship Backing Band style we’ve slightly (or sometimes hugely) modified each song to make it as congregationally singable and playable as we can. So here’s a brief rundown of how we’ve approached each song. The links will take you to where you can buy the MultiTrack, Split Track, Chord Chart and also listen to the 30 second audio preview. Because this song has got quite a defined, succinct arrangement already we didn’t need to alter any of the sections. However as with lots of original Matt Maher recordings we brought down to Bb as it’s a much better compromise for both male and female vocal ranges in church. This was pretty identical in approach to Because He Lives, Amen. Chris Tomlin tends to write complete arrangements focused on maximum congregational singing that don’t need many, if any, changes. But again, because of Chris’s own vocal range the original recording is generally too high to this track has come down to Bb as well. Bethel based songs are often the opposite of Chris Tomlin songs in that the original key can be much more congregational, but the arrangements or repeated sections can be too lengthy. So here we’ve retained all the main sections but we’ve trimmed down the intro, made the outro slightly easier for a worship team to follow and slightly cut down the bridge repeats to make everything more succinct for an average sized church to use. Of course if you want to do a more lengthy (or even shorter) version you can still loop or cut out any of those sections in our MultiTrack Player. This was the trickiest song in this batch to make congregational. There are a couple of well known, but very long, live versions of this song along with a much shorter ‘radio mix’ with very different instrumentation that lots of people like. So in this case we tried to put together a version that incorporates the necessary and best bits of all but kept to around 5 minutes in length with succinct intros and outros. Another tricky element to get around is the timing. The Intros links and verses are written in 7/4 time and the chorus and bridges are in 4/4. So for the tricky 7/4 parts we’ve included a count in our spoken word vocal cue so you know exactly when to come in and out. This was the trickiest song in terms of pitching the key. The original is in B, which is almost totally unsingable for women and even men who can’t sign high! So to give a good compromise both male and female vocals we had to go either much higher or much lower. In this case we felt the best compromise was to bring it down to G and used the instrumentation to keep the intensity up.